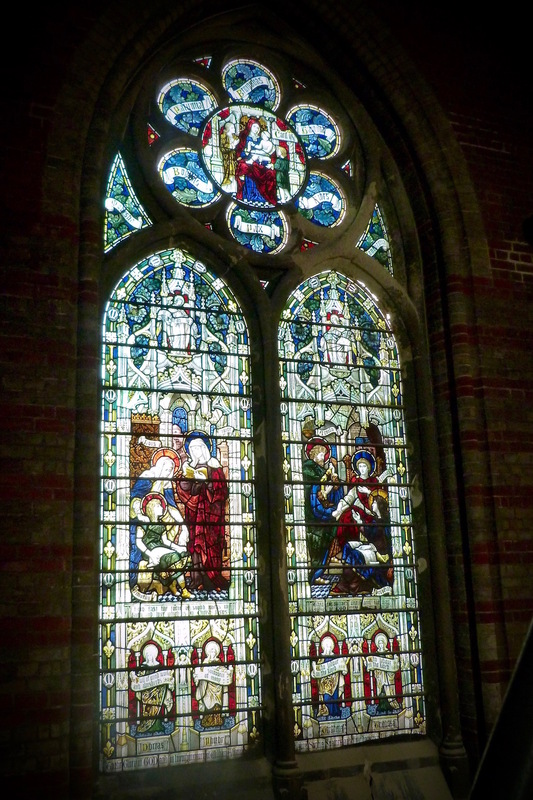 St Mary's has three fine windows in the North Aisle created over a quarter of century by three different but equally skilled stained-glass manufacturers: James Powell & Sons (1897), Burlison & Grylls (1883), and Charles Kempe & Co. (1906). Owing to the church's unconventional north-south orientation, these windows actually face west and thus can often be seen at their loveliest in the late afternoon light. 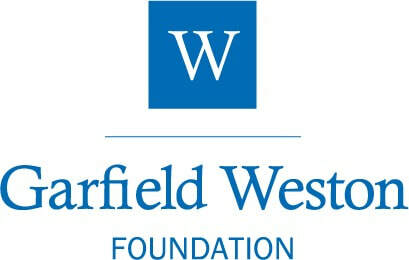 All three are undergoing major repair in 2016, as part of major repairs to the church's west elevation which is being funded in part by the Heritage Lottery Fund, the Garfield Weston Foundation, Sussex Churches Trust and our own reserves and fundraising. 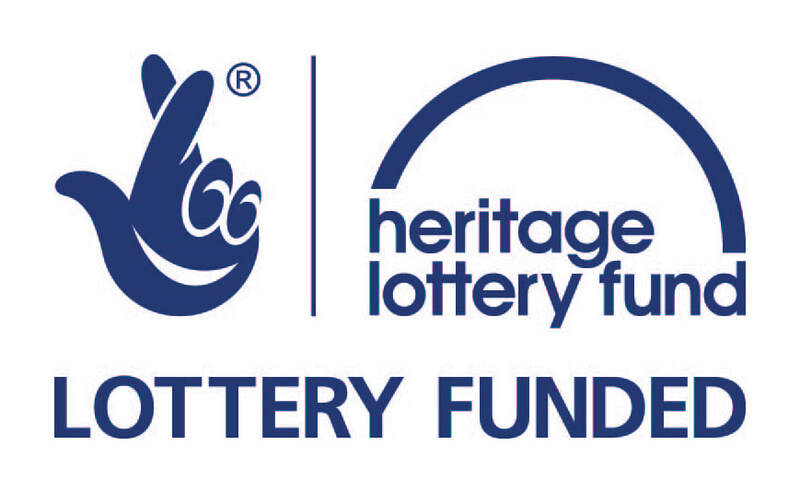 The glass is being removed for repair and cleaning, the decayed stone work and tracery is being largely renewed, and the iron rings in the roundels and saddle bars are being replaced with rust-proof alternatives. When complete, the windows will have new powder-coated steel grilles on the exterior to protect them, instead of the horrid opaque polycarbonate that currently disfigures the church and prevents the windows from being seen clearly. Funds willing, we hope to complete the work in time for Christmas 2016. If you would like to make a donation specifically towards these repairs, the Friends of St Mary's are running an appeal for the Soames Window (see below), which has suffered from particularly poor repair in the past and needs special attention. 'The dead in Christ shall rise first.' 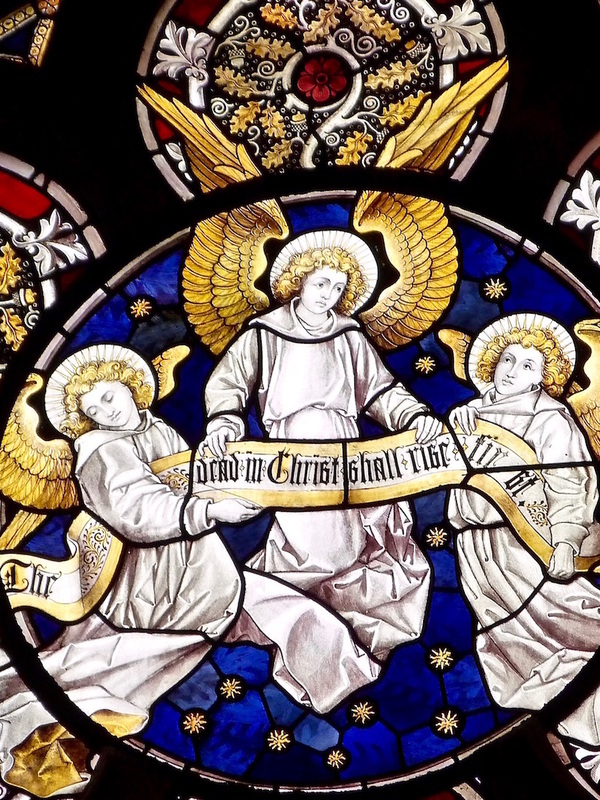 Detail of the roundel from the middle North Aisle window by Burlison & Grylls, 1883. Starting at the baptistery end of the aisle, the first window was created by James Powell & Sons in 1897 in memory of William Aldwin Soames (c.1792-1871) and his wife and daughter. Soames was a soap and oil merchant with commercial interests in Russia who founded Brighton College in 1845. He and his wife Laura Sophia were worshippers at the original St Mary's Chapel and a plaque to their memory survives at St Mary's today. But this window is really the memorial of their daughter Laura (1840-1895), who was a longstanding member of the Brighton School Board and an innovative scholar in phonetics. At her death, she left her estate and future publishing royalties in trust to fund the higher education of poor girls in Brighton and Hove, a trust that continues today under the administration of Brighton and Hove City Council. 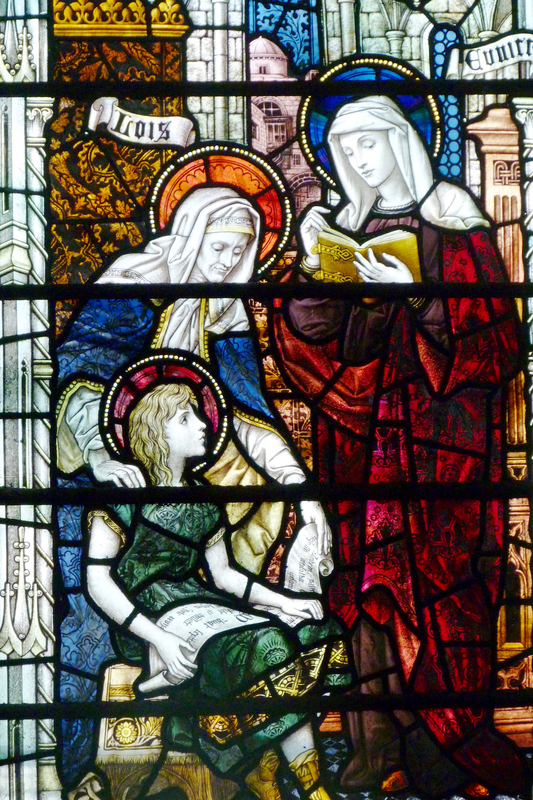 ​The window, commissioned by Laura's siblings, pays tribute to her teaching skills as well as her Christian faith and depicts a remarkable seven women teachers and guides from the early Church. in the lefthand panel, Lois and and her daughter Eunice are seen teaching Eunice's son Timothy, future companion of Paul and bishop of Ephesus. In the righthand panel, Priscilla and her husband Aquila, devout companions of Paul, instruct the Alexandrian preacher Apollos. 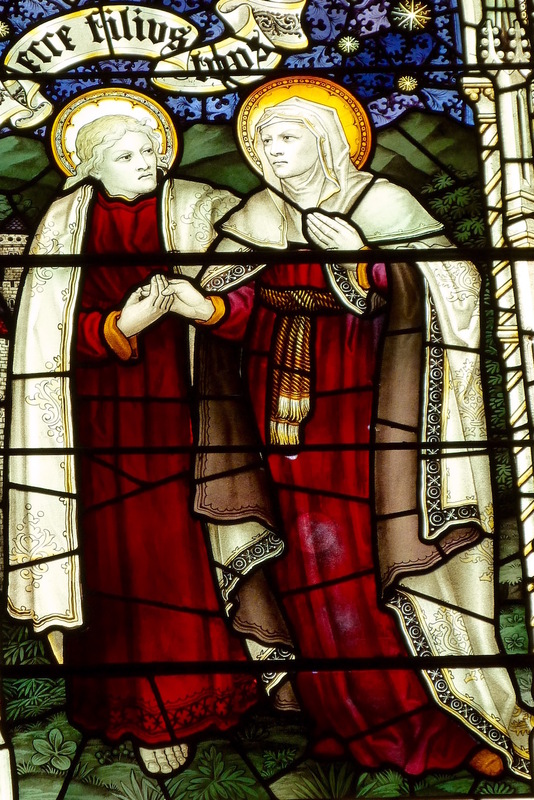 In the vignettes beneath, four more early Christian women workers are named: Dorcas and Phoebe, and Tryphosa and Tryphena. 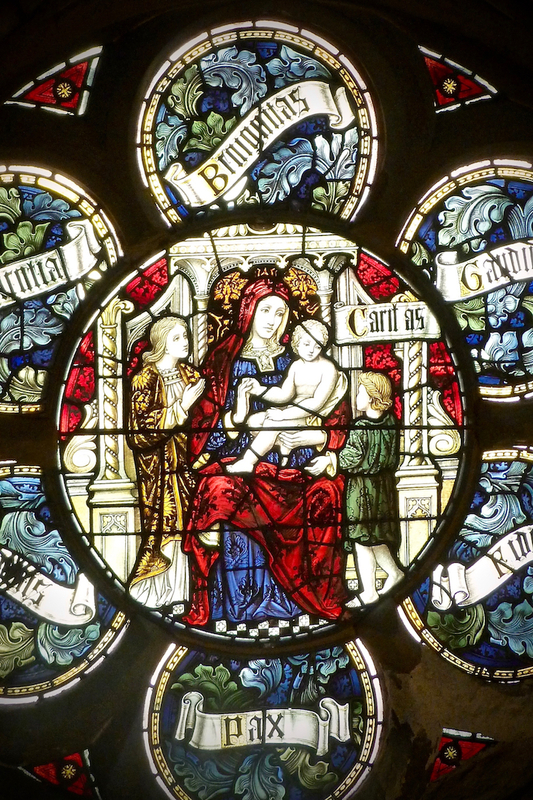 The Soames Window - detail of central image in roundel, by James Powell & Sons, 1897. 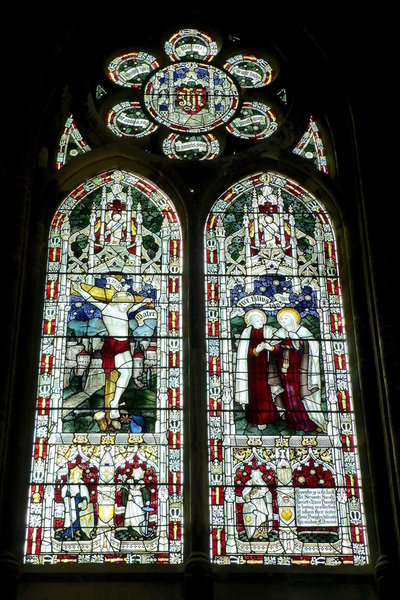 The middle of the North Aisle windows was created in 1883 by Burlison & Grylls in memory of Emma Bell, who died on 6 December 1880, 20 days short of her 80th birthday. Her husband, Edward Bell (c.1795–1893), of 48, Marine Parade, Brighton, began his working life as a seedsman and ended it as the director of several fertilizer and phosphate companies. He was a long-standing parishioner of St Mary’s and his window in Emma's memory was one of the first to be added after the new church’s completion. 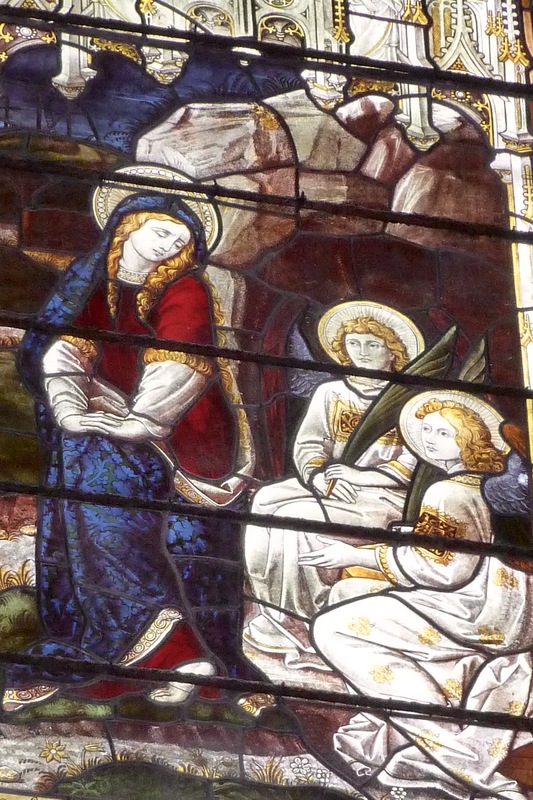 The left-hand panel shows Mary Magdalene at the empty tomb: 'He is not here but is risen.' 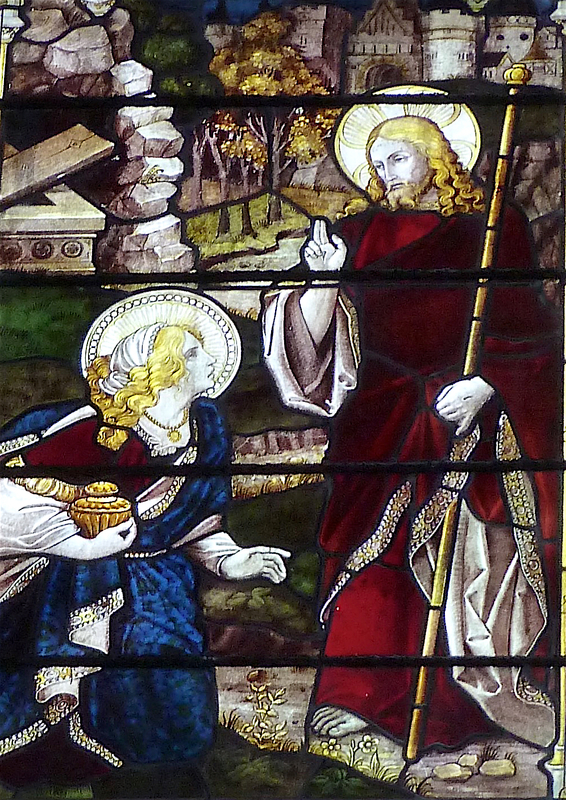 The right-hand panel shows her realization that she is in the presence of the risen Christ: 'She saith unto him: Rabboni.' In the vignettes beneath are the Old Testament prophets: Isaiah and Jeremiah, Daniel and Ezekiel. The roundel has a particularly lovely depiction of angels in a starlit sky holding a banner: 'The dead in Christ shall rise first.' (1 Thessalonians 4.16). 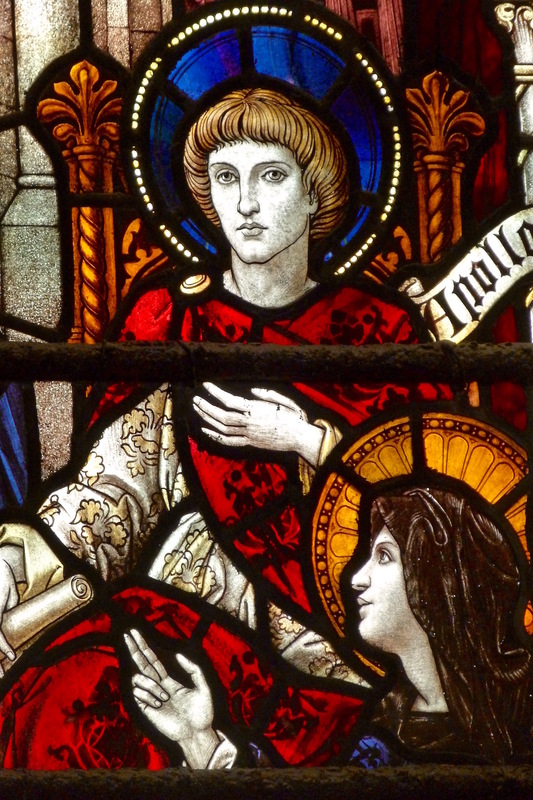 The artists John Burlison (1843-1891) and Thomas Grylls (1845-1913) trained with the well-known English firm of Clayton and Bell, as did Alfred Octavius Hemming, who created eight of the other windows at St Mary's, including the three pictorial Chancel windows. 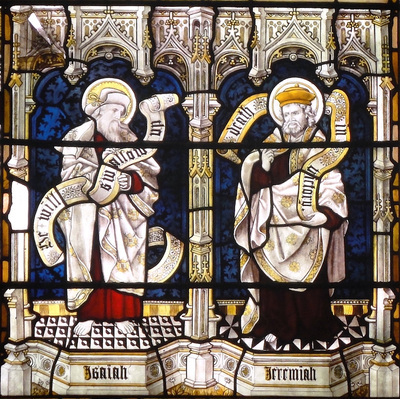 This shared lineage helps to explain why the windows in the church sit so happily together despite the variety of makers. 'She saith unto him: Rabboni.' Detail of right-hand panel of the Bell Window, by Burlison & Grylls, 1883. 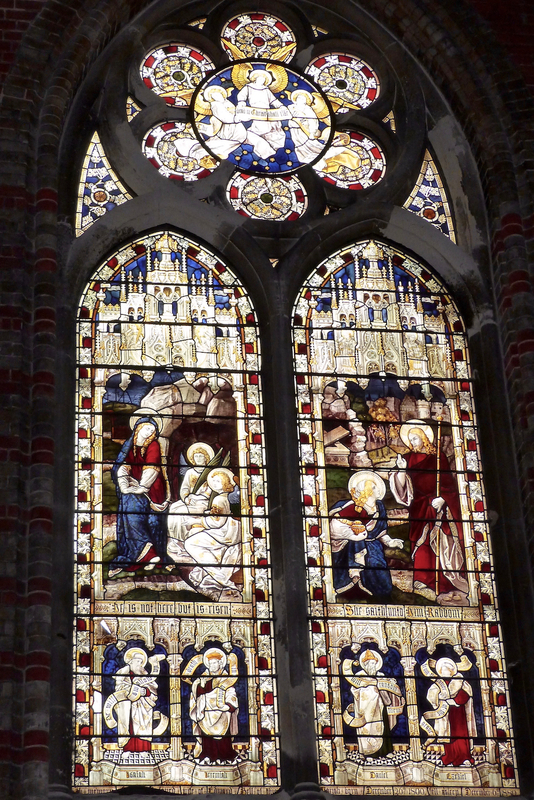 The third window in the North Aisle, the one closest to the transept, was created in 1906 by the well-known firm of C. E. Kempe & Co., in memory of three sisters: Sarah, Hariett and Lizzie (Eliza). A fourth sister, Annie, sponsored the window. Together the four sisters, who were the daughters of a church organist from Salisbury, ran a senior girls' school at Lewes Crescent in the 1870s and 1880s. 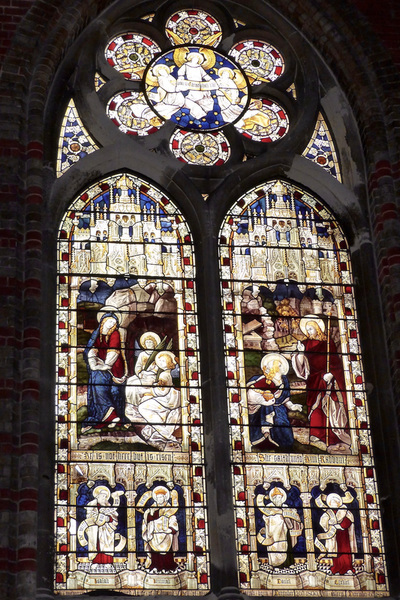 Another window dedicated to Lizzie alone is in the baptistery and is the work of Alfred Octavius Hemming. 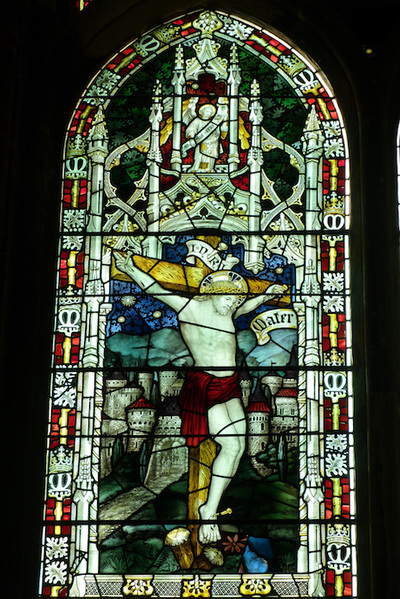 The left-hand panel of the Prangley Window depicts the Crucifixion, with the scene of Christ entrusting his mother to the care of John on the right. 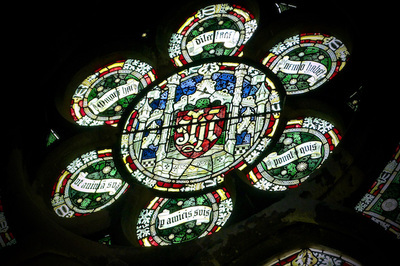 Vignettes beneath show Faith, Hope and Charity, with a large inscription panel to the sisters: Remember ye in the Lord/His servants Sarah,/Harriett & Lizzie Prangley/in loving recollection/of whom their sister/Annie Prangley dedicates/this window mcmvi. 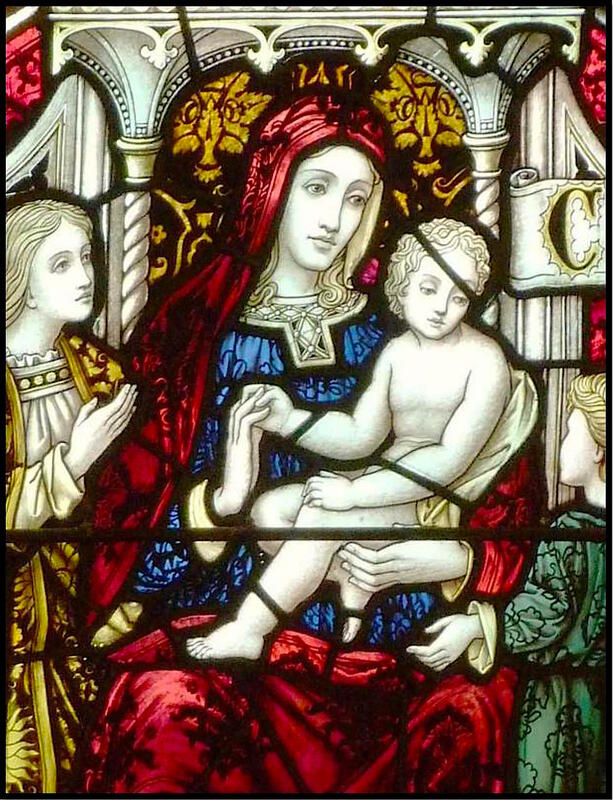 As a 'Kempe window', this is one of St Mary's most noted ones, although its 1906 creation date may mean it was not personally designed by Charles Eamer Kempe, who died in 1907, aged 69. 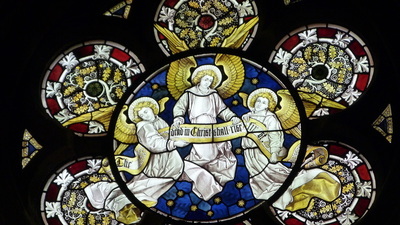 The blue-green toning, unusual for Kempe's work, may have been chosen to harmonize with the Soames Window by James Powell & Sons at the other end of the aisle. The small wheatsheaf, Kempe's maker's mark, may be seen incorporated in the left-hand border, just up from the bottom of the window. 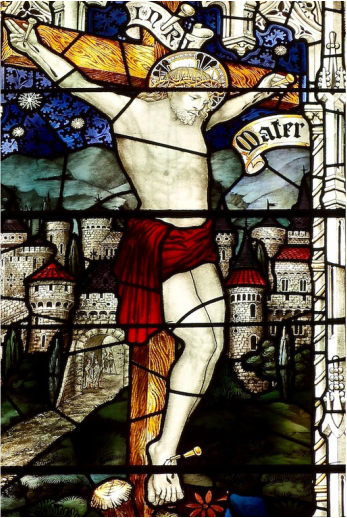 Detail of the Crucifixion panel from the Prangley Window, by Charles Kempe & Co., 1906.